I've been listening to a free Meditation app on my phone, called INSIGHT TIMER. You can also listen online here: https://insighttimer.com/meditation-app. I am totally enjoying a variety of meditations on many topics: psychology, good sleep, anxiety, life changes, transformation, energy cleanses, and it goes on and on. The Facebook group for Insight Timer says they have 900 teachers on one app! Some I listened to and knew, in less than a minute, that it was not for me. Others I've bookmarked and listened to multiple times. I have bookmarked several meditations by LIVE AWAKE, Sarah Blondin and wanted to say, if you are struggling with retirement, they might help you. One is called "Accepting Change" and how life always changes, how our world morphs continually but we want to run and grasp the pieces to keep it as it was. I really like it. Another is "Learning to Honour Our Rythms and Cycles"... it's more of the same, how our life has cycles, just as the flowers can't bloom continually, and we need some down time for ourselves. Both resonated with me... maybe they will with you too? I've been thinking about the retirement transition months/years as I listen to both and trying to find the wisdom within. You may or may not like it, we all have different thoughts on this, but I just had to share! Even if you've never meditated, and it does take time to quiet the mind and enjoy this... it sure does benefit your mind and soul once it takes hold! INSIGHT TIMER... it's free! Get it here!. I have been a Insight Timer user since 2014. I did not think to post this on the Retirement site. I do hope others wilo join us. 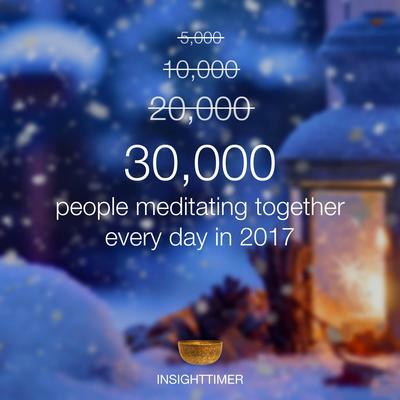 I am one of the 115,000 doing meditations daily, the reason for that is - Insight Timer. Again, thank you. Thank you for writing about MEDITATION and giving us info on sources from where we can learn to go deeper in this. I intend to use this information and learn more. Many years ago I joined a one day session on Maharshi Mahesh Yogi's TRANSCENDENTAL MEDITATION. I was surprised that the session was to be held at a venue facing the noisy and busy Ring Road, close to the New Delhi South Extension market. I pointed this out to Mr. Mukherjee, the teacher who was to preside over the one to one session. He smiled and did not say anything. As the session commenced the noise of the traffic on the busy road seemed to go down, as if I am turning the volume knob on the radio anti-clock wise. There was complete silence and I seemed to go into sleep. When I came to my senses, I realized that I was not asleep. I felt refreshed. The road sound came back. I cannot explain my experience. Ganga. A lot of people there would engage in a daily routince of PUJA (devotional worship) of Hindu faith. Many of them would spend a few minutes in DHYAN (meditation) that they had learned from their GURUs. Most of the worshippers exuded peace and tranquility. These included Babuji and Amma (our parents) and Chhoti Dadi (my father's aged aunt). I do not recall every seeing them agitated. They were always peaceful. That was the power of meditation. Later, I attended two courses of a month each on Yoga, where they taught Yoga practices, including DHYAN. I have found it very useful. These days, I am seeing the emergence of SWAR YOGA ...(Yoga practice accompanied by sound of indigenous musical instruments like drums, cymbals and bells.) I foresee a great popularity of Swar Yoga. Meditation, Yoga and similar practices are specially beneficial for retired people.